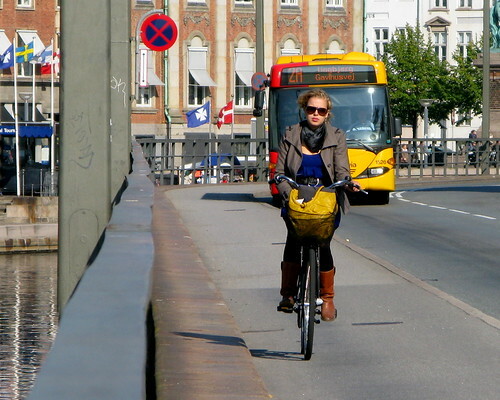 A definite candidate for the Copenhagen Cycle Chic All-Star Team. Smashing ensemble with shiny tights, heels, funky pink mini bike and partisan scarf. I love this bike lane along one of the canals. Yes, great look, but only for the very young and very slim. At my boomerish age, a skirt over the leggings is de rigueur. But it is cool and grey today, so I can get out my red béret, speaking of partisan! Not quite cool enough for the matching gloves. I like the puffy dreads on the first pic too, we see a lot of that around SF, but not so much on skinny hipster looking girls. Mostly the hippy chicks around Golden Gate Park. It's a great look though, especially with well kept hair, not those nappy drippy dreads you see so much more frequently. take 3 bras, pay for 2! not so hot about those tights (AmAp is making them ubuquitous in Paris) or the glasses, but there's definitely an allure. ...she looks like an Olsen twin in a kaffiyeh and shiny (possibly spandex) harem pants. Or possibly I simply cannot locate the skirt? I think I prefer that 1970s pink folding bike over the girl.